Globally cataract is one of the most common forms of visual impairment and one of the leading indications for eye surgery. Modern cataract surgery involves removal of the natural crystalline lens with an intraocular implant, typically suspended in the same anatomical position as the natural lens, by means of a capsular bag. 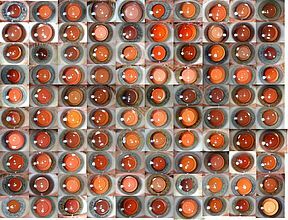 The lenticular epithelial cells (LECs) of the capsule typically display a low metabolic rate and slow turnover. When the natural lens of the eye is disturbed however, the LECs may respond by proliferating and transforming and may ultimately impair the vision even after an uncomplicated cataract procedure. These changes within the capsular bag are termed posterior capsular opacification (PCO) and, even now, are the most common complications of modern cataract surgery. Even the most cutting-edge implant appears to delay PCO development rather than prevent it. 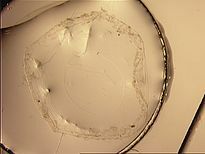 In the University of Antwerp we have pioneered a unique approach, combining surgical techniques with advances in lens optics, to provide the most effective means of preventing PCO entirely. The standard surgical approach of placing the “lens-in-the-bag” to emulate the natural lens position suffers from the fact that even the most technologically advanced lens implant is not a natural biological material. The natural response therefore is one of scarring and fibrosis consistent with that seen in PCO. This is no more apparent than in babies and children, where the aggressive healing response leads to rates of post surgical opacification nearing 100%. We decided therefore to redesign the nature of the lens-capsule relationship. 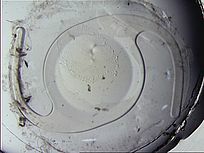 The “Bag-in-the-lens” BIL implant is a monofocal spherical hydrophilic intraocular lens comprised of a 5mm bi-convex optic with two elliptical plane haptics (Fig.1). The haptics are aligned perpendicular to one another. During surgery, a carefully centred 5mm hole is created in the anterior capsule. After the crystalline lens is extracted, a matching 5mm hole is created in the posterior capsule. When the BIL is positioned into place, the posterior haptics slide under the posterior capsule and the anterior haptics rest on top of the anterior capsule. The end result is that the BIL implant sandwiches the two layers of capsule and seals the LECs in the interhaptic groove. Our early research into the effectiveness of this technique showed that the LECs respond any traumatic insult with proliferation and transformation. 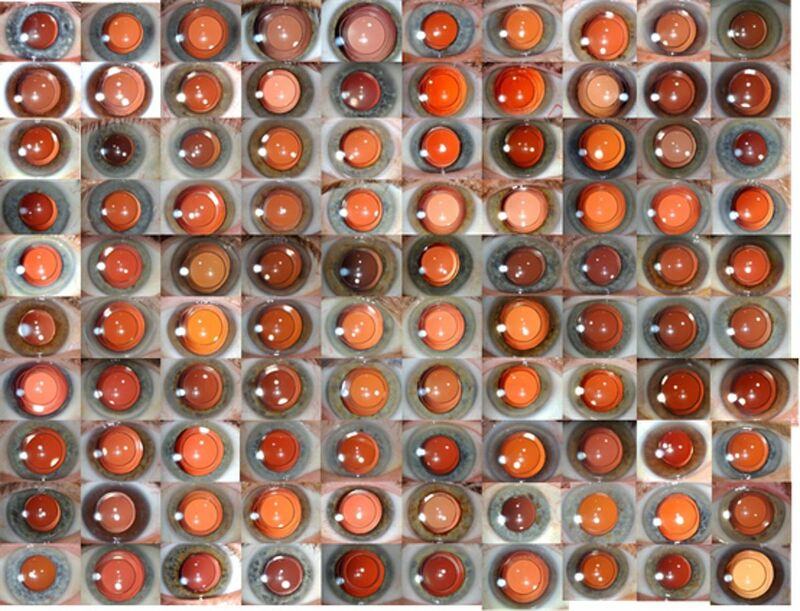 The in-vitro culture of capsular bags confirmed that LECs proliferate in the central visual axis in bags without an IOL and those with a standard IOL (Figure 2A, B). 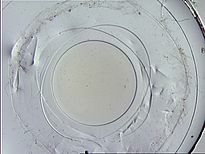 In the case of the BIL, LEC growth occurred but the mechanical obstruction of the lens prevented the access of cells to the visual axis (Figure 2C). Figure 3. 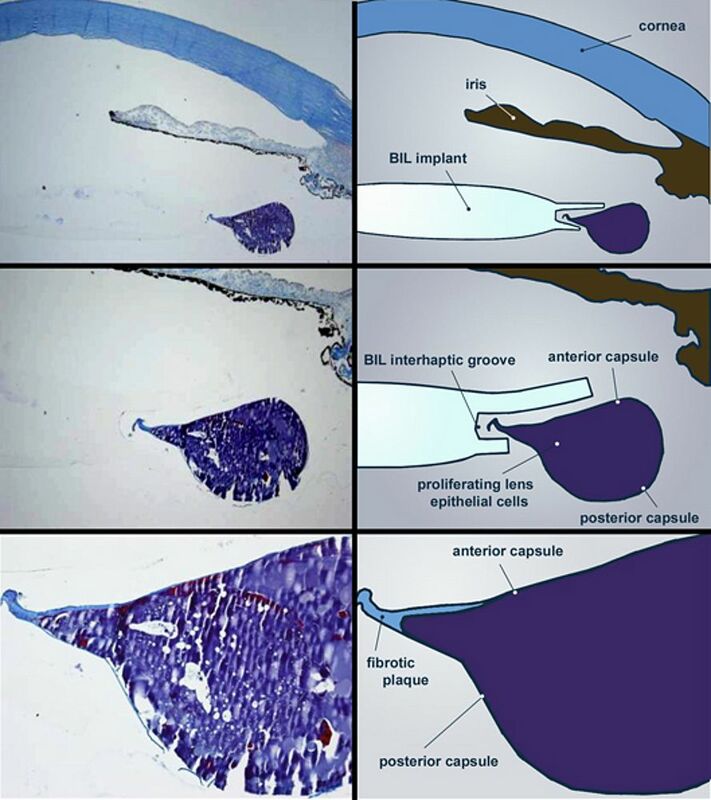 Histology of BIL three years after implantation with corresponding schematic A: Magnification (x20) showing an overview of the BIL in situ. B: Magnification (x40) demonstrating restriction of proliferation within the interhaptic groove of the BIL. C: Magnification (x100) showing fibrotic plaque at the interhaptic groove sealing the proliferation within anterior and posterior capsules. Current teaching of the standard cataract approach stresses the importance of leaving the posterior capsule intact. Surgeries in which the posterior capsule is accidentally ruptured result in higher postoperative complications such as vitreous loss and macular oedema. This has led to reluctance in performing the incision into the posterior capsule required to place the BIL. We have challenge this conventional wisdom and discovered a fundamental difference between the diffusion properties of an accidental traumatic rupture and careful planned incision of the capsule. We recently reported a cohort of 807 BIL outcomes and found that the eye retains the risk profile of an eye with an intact capsule. Congential and paediatric cataracts are extremely prone to aggressive visual axis reproliferation and in many cases require multiple surgeries. We have found that the BIL, when sited correctly at primary surgery, results in preservation of visual axis clarity far surpassing other surgical approaches. The BIL is also uniquely easy to remove and exchange, which is of particular benefit in the growing eye of a child. Over the years, experiences with our BIL design have yielded some unexpected results. Without a haptic to anchor it, we were concerned the BIL would be prone to a decentration or a rotational effect. We have found however over a long period of follow up, that the fibrosis of the residual capsular bag is distributed circumferentially around the implant, tightening the grip around the lens. [7, 8] This actually confers greater centration and stability than the standard approach (Figure 5). The lens, therefore, stays were it is meant to be. This dependability has allowed us to develop successful toric implants, and in future we will be developing multifocal lens implants to allow the incorporation of complex lens optics into this system. Ten-year follow up has proven that quality visual outcomes are dependable and the visual axes retain their clarity (Figure 6). We are continually pleased with the dependability, versatility and long-term safety of our lens designs beyond our original expectations and we continue to pioneer implant approaches to provide a wider range of one-stop treatment options for cataract patients of all ages. The author would like to express gratitude to Dr. Sorcha Ní Dhubhghaill and Mr Rudi Leysen for their assistance in preparing this submission. Spalton, D., Posterior Capsule Opacification: have we made a difference? Br J Ophthalmol, 2013. 97(1): p. 1-2. De Keyzer K, L.I., Timmermans JP, Tassignon MJ., Lens epithelial cells in an in vitro capsular bag model: lens-in-the-bag versus bag-in-the-lens technique. J Cataract Refract Surg, 2008. Apr 34(4): p. 687-95. Leysen I, C.T., Gobin L, Smet H, Daniel Y, DeGroot V, Tassignon MJ., Cumulative neodymium: YAG laser rates after bag-in-the-lens and lens-in-the-bag intraocular lens implantation: comparative study. J Cataract Refract Surg, 2006. Dec 32(12): p. 2085-90. 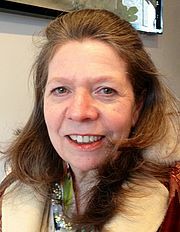 De Groot V, Hubert M, Van Best JA, Engelen S, Van Aelst S, Tassignon MJ. , Lack of fluorophotometric evidence of aqueous-vitreous barrier disruption after posterior capsulorhexis. J Cataract Refract Surg, 2003. Dec 29(12): p. 2330-8. Tassignon MJ, G.L., Mathysen D, Van Looveren J, De Groot V., Clinical outcomes of cataract surgery after the bag-in-the-lens intraocular lens implantation following ISO standard 11979-7:2006. J Cataract Refract Surg, 2011. Dec 37(12): p. 2120-9. Tassignon MJ, D.V.I., Godts D, Kosec D, Van den Dooren K, Gobin L., Bag-in-the-lens intraocular lens implantation in the pediatric eye. J Cataract Refract Surg, 2007. Apr 33(4): p. 611-7. 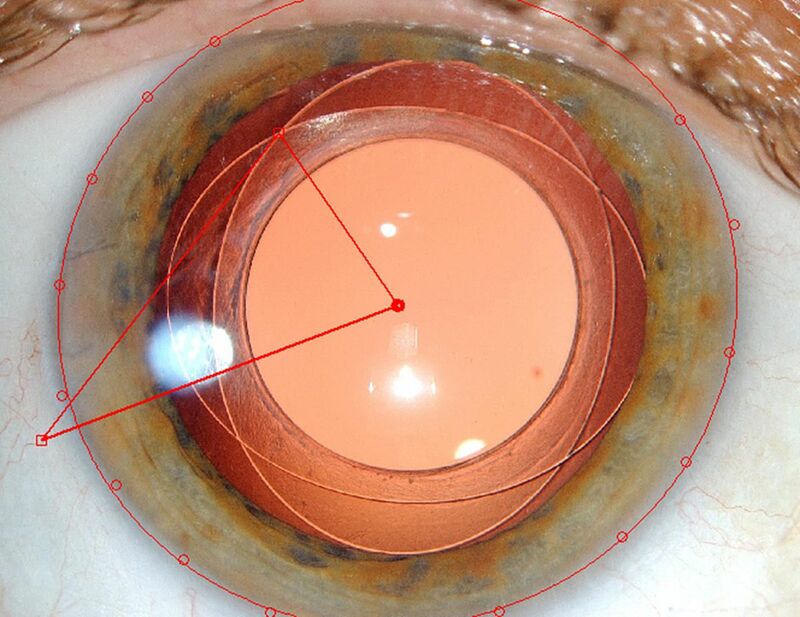 Verbruggen KHM, R.J., Gobin L, Coeckelbergh T, De Groot V, Tassignon MJ., Intraocular lens centration and visual outcomes after bag-in-the-lens implantation. J Cataract Refract Surg, 2007. Jul 33(7): p. 1267-72. Rozema JJ, G.L., Verbruggen K, Tassignon MJ., Changes in rotation after implantation of a bag-in-the-lens intraocular lens. J Cataract Refract Surg, 2009. Aug 35(8): p. 1385-8. 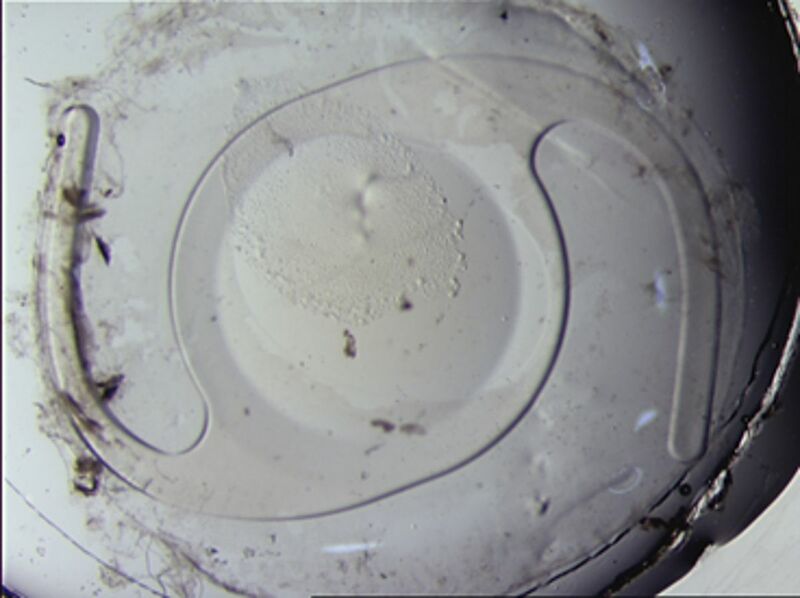 Tassignon MJBR, i.M.G., assignee., Intraocular lens and method for preventing secondary opacification. US patent 6 027 531., 2000.